Many of your clients and prospects are spending more time on the Web these days, but they are also becoming more selective about what they read. To make matters worse, you have a limited budget for getting their attention and generating quality leads for your sales force. It's a major challenge. But one tool that can help is the consultative "white paper." According to ServiceWare, a provider of Web-based knowledge management solutions for customer service and support, "research shows that 69% of prospects who download and like your white paper PDF will actively pass it on to their colleagues. 36% will pass it on to a direct supervisor." The key word here is "like." In an age where everyone is being run over by traffic on the information superhighway, you need a pretty enticing "billboard" to get their attention and prompt them to share your message. The truth is that most white papers are anything but riveting. The worst of them are soft-sell propaganda, and readers will spot that sort of manipulation quickly. Gather compelling topic ideas from your sales, business development and customer service departments. You should also review the trade press and other institutions' white papers for potential topics. Additionally, in financial services, there are many opportunities to find "hot topics" at trade shows and conferences. Once you choose a topic, most experts agree that the actual writing should be outsourced rather than written in house. A good writing service can help to not only keep the information objective, but can put a distinctive "voice" to it, one to which the reader can relate. This way the reader is both informed and engaged and more likely to pass the information along to others. Using an outside writer enables you to step back from a subject and look at it from a client's perspective. Too often this perspective is lacking in the communications that banks send to their clients. As a result, clients really appreciate it when you make the extra effort to "walk a mile in their shoes." Ask any newspaper or magazine editor what sells copies and "catchy headlines" is the likely answer. 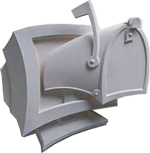 White papers, newsletters and other online communications are no exception. While there's no scientific formula to creating a catchy headline, by putting yourself in the reader's shoes, you've got a good start. Speak directly to the audience, be clear and concise, and by all means make sure the white paper reads like it's about them and their challenges, and not you and your sales goals. Use phrases like "insider tips," "save time and money," "increase your bottom line in three easy steps," etc. One of the most cost efficient and effective ways to promote your white paper, newsletter or other online client communication is by using direct mail in the form of postcards. Martha Retallick is the author of Postcard Marketing Secrets, a step-by-step guide to marketing through postcards. According to her, you need to send a series of postcards in order for recipients to begin recognizing and responding to them. You can use the postcard to promote the wealth of information available on your Web site. Include teaser copy that gives recipients a taste of what they'll find on your site, Ms. Retallick advises. This can build up your reader base nicely over time. Click here to see a sample postcard. Ms. Retallick suggests that you plan a series of 12 cards and send them out religiously once a month. If you have an "A" list of prospects, call them within a week of the mailing to follow up, or follow up with an e-mail. If you are not already a MarketScope subscriber, click here to receive your own free monthly edition.